As observers accused the CPP of orchestrating Monday’s savage beating of two opposition lawmakers, images emerged Tuesday of a senior military commander rallying troops to support calls to oust Kem Sokha as the National Assembly’s vice president. Opposition lawmakers Nhay Cham­roeun and Kong Saphea were left with serious injuries after thugs at a protest led by a CPP-aligned youth group dragged them from their cars and beat them in front of the National Assembly Monday. The Siem Reap Provincial Court last week convicted Tao Savoeun, 26, of threatening to kill Interior Minister Sar Kheng at a graduation ceremony but will only require him to serve one month of his 15-month prison sentence. 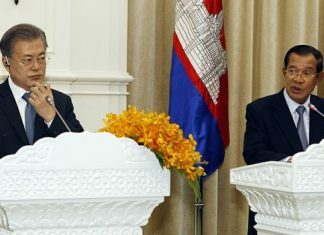 Prime Minister Hun Sen’s official state visit to Paris to meet with French President Francois Hollande was marked by protests and controversy after allegations arose that the prime minister had required Cambodian students studying in France to attend a talk he was set to give yesterday or have their scholarships revoked. At the edge of this expanse of barren land, a house lies buried, filled almost to its roof with sand. This is the Khin family home, the last in their village after more than 3,000 families were evicted from the area to make way for development. Prime Minister Hun Sen’s middle son, Hun Manith, has been appointed as director of the Defense Ministry’s military intelligence unit, according to a sub-decree issued by his father last month, making him the second of the premier’s sons to ascend to the upper echelons of the military. The man who plowed a truck into the side of Prince Norodom Ranariddh’s SUV in Kompong Cham province in April, leaving the prince’s wife with head injuries, was sentenced in absentia to three years in jail on Wednesday, with the truck’s owner ordered to pay $100,000 compensation, according to lawyers for both parties. Following the announcement earlier this month that the monthly minimum wage in the garment sector will be raised from $128 to $140 next year, eight unions representing factory workers issued a list of 13 demands on Tuesday, threatening protests if their requests go ignored. A leading rights worker charged with public defamation and attempting to coerce judicial officials failed to appear in court for questioning Wednesday, despite a threat by Investigating Judge Veng Hourt that failure to heed a summons issued earlier this month would result in his retrieval by force. During a closed-door meeting on Monday, Defense Minister Tea Banh told a Vietnamese counterpart of the CPP’s success in suppressing an opposition campaign to highlight border incursions by Vietnam and urged Hanoi to help ensure that the issue does not re-emerge. A garment worker was killed and at least 26 others were injured in Kompong Speu province Tuesday morning when a van transporting them to work collided with a cargo truck, officials said. Defense Minister Tea Banh reassured Vietnam’s deputy defense minister Monday that the Cambodian government had “controlled” the situation along the countries’ shared border. Oddar Meanchey provincial police chief Men Ly said yesterday he will launch an investigation into the burning of an opposition CNRP sign during a protest in Samraong City on Friday led by a defector to the ruling CPP. At events marking the third anniversary of King Norodom Sihanouk’s death Thursday, deputy opposition leader Kem Sokha and Prince Norodom Ranariddh provided differing opinions about reports suggesting that the CNRP and Funcinpec are considering a merger. While police continued to search for a man suspected of murdering his wife with an ax after a drunken argument in Kompong Cham province on Monday, officers in neighboring Tbong Khmum province arrested another man who allegedly hacked his wife under similar circumstances on Wednesday. Prime Minister Hun Sen used the occasion of the Islamic New Year on Wednesday to warn the country’s Cham Muslims that a change in government could lead to widespread slaughter and persecution of Muslims, like under the Khmer Rouge. Foreign Affairs Minister Hor Namhong met with South Korea’s dep­uty minister for political affairs yesterday to offer his gratitude for a $35 mil­lion university that South Korea has pledged to build in Cambodia, an of­ficial said. A Rohingya refugee who landed in Phnom Penh in June as part of a controversial resettlement deal with Australia is likely back in Burma after requesting to return home, according to the Interior Ministry. Hundreds of officials from more than 40 government ministries and state institutions will lay wreaths at the statue of the late King Norodom Sihanouk in Phnom Penh on Thursday to mark the third anniversary of his death. A man was arrested in Tbong Khmum province on Monday for beating his wife to death after she accused him of wasting money on a party that morning, police said Tuesday.